There's lot to write about, particularly the adventure of co-roasting a goose for dinner the other night, but I'll get to that when I make goose stock, hopefully soon. Today's slow-payoff project was to brine Meyer lemons. A few weeks ago I'd purchased Meyer lemons to make curd but never got around to it. As it's the beginning of the season around here, I figured I will have a chance in a few weeks to do that but these lemons really shouldn't wait that long. 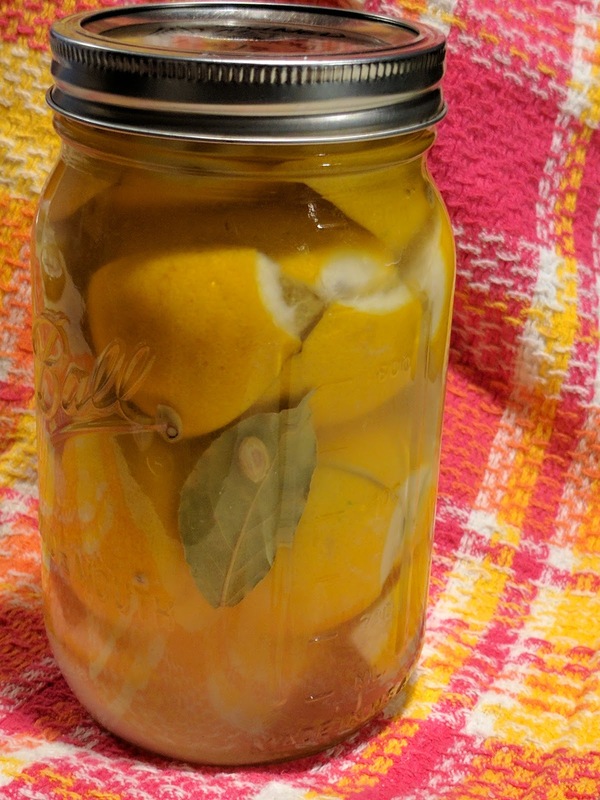 My sister tipped me off to a blog called Punk Domestics (although, I think I made the slow cooker pulled pork using a recipe from there a long time ago) and I saw that someone had brined lemons for a year, dehydrated them and then ground them into a powder which was used as a spice. That sounds awesome. I want to do that. Getting the lemons brined is a very quick process. I followed these instructions and incompletely quartered them and salted them, but when it was time to get them into the jar I added bay leaves and some water which had been boiled and then cooled, so I knew it was sterile. I'll leave it on the counter a few days until the salt has been dissolved and then they'll go into the fridge for 6-12 months. That gives me that much time to figure out if I want to purchase a dehydrator or maybe by then I'll have an oven with a dehydrator feature. We'll see!